"For our country to love us as much as we love it! That's what I want." Rambo: First Blood Part II is everything I have come to expect from sequels. Its sole purpose is to capitalize on the success of the original. Furthermore, everything about it pales in comparison to the elements that made the original such a fine film. What we are left with is a driven marketing campaign rather than a quality motion picture. At the start of the film, we find Vietnam veteran and Congressional Medal of Honor recipient, John Rambo (Sylvester Stallone), smashing rocks in state prison for the crimes he committed in First Blood. He is visited by his mentor, Colonel Trautman (Richard Crenna), and given a chance for presidential pardon. What is the catch? "Re-con mission for POWs in 'Nam," says Trautman. No one knows the terrain of the POW camp better than Rambo does, and of course, no one can go in and blast the "bad guys" quite like he can. Under the command of the sleazy Marshall Murdock (Charles Napier), Rambo's orders are to infiltrate the camp, but under no circumstances is he to engage the enemy; he is to only take photographs. Rambo seems less than thrilled about the futility of the mission. Taking matters into his own hands, he wreaks havoc against the Vietnamese and Russian armies in an attempt to free the long time prisoners of war. The resulting violence feels more like a Saturday morning cartoon than an serious war picture. The idea of a one-man army has been taken much too far this time around. In First Blood, we saw Rambo as a veteran who was deeply skilled in the art of combat and survival; here he seems to be surrounded by an invisible shield that allows him to accomplish inane feats that would wear out Superman. He is able to stay out of the way of the bullets simply because he is Rambo, not because of any survival techniques he may have learned. The film even resorts to the action picture clich� where the villain conveniently waits to shoot at the hero until the hero is able to get a better shot at the villain. A film this silly had better consist of intense action sequences or risk all merit being thrown out the window. There is only one such sequence in Rambo: First Blood Part II that I found to be gripping. With the Russian army in search of the recently escaped Rambo, this scene mirrors the tense mountain chase scene from First Blood with acceptable results. The way in which Rambo silently lurks in and out of the shadows unnoticed is particularly effective. All of the other action scenes are terribly dull and seem to exist only for the sake of exciting the audience, which they do not. 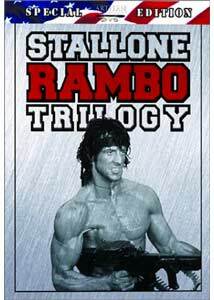 Whether Rambo is being dragged behind an airplane or destroying an entire army after he has been nearly electrocuted to death, the action sequences in this sequel are completely void of the atmospheric tension created in the original. Even though they are heavily counterbalanced by extreme absurdities, there are several attributes that make this film worthwhile. The stylistic use of the 2.35:1 frame is exemplified with stark lighting, but much of the picture does not look convincing. It was said to be filmed entirely on location in beautiful Acapulco, Mexico, but I would not be surprised if many of the nighttime jungle sequences were filmed on a back lot in Culver City, California. When Rambo first catches a glimpse of the undernourished POWs it is quite gruesome, as it should be. Yet, as the film briskly turns into a mindless action vehicle, this image fades all too quickly. In many ways, Rambo: First Blood Part II was the dawn of what I came to despise about action pictures of the late 1980s. While minimal, the campy one-line jokes are neither humorous nor appropriate for a film of this nature. Additionally, the attempt to give Rambo female companionship in the middle of extreme combat is purely ludicrous. His brief romantic encounter with Co Bao (Julia Nickson) had me envisioning a board meeting of brokers in expensive suits discussing ways they could make this film more successful—yet another terrible idea conceived by Hollywood big shots. Rather than making a profound impact about the horrors of war, Rambo: First Blood Part II is structured merely as a way to bring the audience to its feet cheering. This may be acceptable in another picture, but it is disconcerting to have the real-life facet of Vietnam prisoners of war reduced to a light-hearted romp. Perhaps the film would have worked better had it sacrificed its focus on Vietnam for a more fictional scenario. Instead, the film takes the Vietnam War and reduces it to easily digestible fodder for the casual movie-going popcorn munchers. The result is a film that is neither profound nor entertaining. Image Transfer Review: This is another fantastic transfer. The 2.35:1 anamorphic image displays several deficiencies, yet they appear to be related to the source. Color is more balanced than on First Blood, appearing particularly bold during scenes of bright daylight. However, the nighttime scenes prove to be problematic, exhibiting poor shadow delineation and an irritating red hue. At times, the picture appears dingy and hazy as if the print needs to be dusted off, though I did not find this surprising for a film that is 17 years old. What I did find surprising was how vibrant a great deal of the image was, appearing as clear and strong as many recent movies. Also impressive is the noticeable lack of video artifacts, which are what I always find most bothersome. Although the image may not seem as impressive a restoration effort as First Blood, few of the problems appear to be related to the transfer. This is a job well done. A pan & scan version is also available on side B. In addition to significantly altering the original aspect ratio, the image quality is not nearly as good as the widescreen version. Audio Transfer Review: As with First Blood, both DTS and Dolby Digital 5.1 soundtracks are offered. The original mix again appears to be only subtly altered, yet here, I found this more of a distraction. The mix leans much more heavily towards the front soundstage than I had expected. Especially disappointing is a noticeable lack of musical presence in the surrounds. The music does exhibit a wide stereo presence throughout the front channels, yet much of the soundtrack is too constricted, even sounding monaural at times. Surround use is incredibly disappointing. Much more so than First Blood, this is a brash and over-the-top film that requires aggressive use of surround speakers. The rear speakers engage for a few instances of helicopters, thunder, and explosions, but otherwise lie dormant. Fortunately, the addition of the LFE channel effectively helps deepen the sound of the many explosions, although the low end often seems post-processed and somewhat unnatural. The saving grace of the audio is its remarkable fidelity; dialogue always sounds crisp and clean even during peak action sequences. The soundtrack is serviceable, but I expected more from an action picture. The original Dolby Surround track is also available. While there is not a striking difference between these tracks, the 5.1 and DTS versions are still preferred. Extras Review: Although the extras are structured the same, most of what I enjoyed about the First Blood DVD is absent here, starting with a lackluster audio commentary by director George P. Cosmatos. Cosmatos not only sounds as if he is reading his commentary from a script, but speaks as if he is heavily sedated as well. Despite the fact that many of his comments are interesting, his subdued speech makes for an extremely boring experience. He focuses his discussion on the technical aspects of the film, including the staging of action sequences and the hardships of filming on location. Any discussion regarding story or character development is non-existent, which hardly surprised me. Even so, it was distracting to hear nothing but silence from Cosmatos as he watched scenes involving long passages of dialogue. He seems to understand his source material and show an appreciation for it, yet I got the sense that he was only concerned with creating a grand spectacle rather than creating a solid motion picture. Both the film and the commentary can best be summed up by one of Cosmatos's comments, "This didn't work out the way we wanted it to, but we tried our best." The documentary We Get to Win This Time is comprised of segments from the same interview session seen on the First Blood documentary, along with a few new guests. All of the participants are overly enthusiastic about Rambo: First Blood Part II, yet the interviews lack passion. The documentary is divided into several uninteresting subsections, the worst of which is entitled The Rambo Workout. Though his training proved to be quite admirable, it seems rather sad that they devoted an entire section to Sylvester Stallone's bulbous pecs. A conversation with the film editors is what makes this documentary worthwhile. Particularly interesting are the before and after shots that demonstrate the importance of editing. Unsurprisingly, the documentary ends with the cast and crew exclaiming their joy for how well the film tidied up at the box office. There's a section that contains a theatrical trailer and a brief teaser trailer. Both are presented in pan & scan with stereo sound. I appreciate how raw and unkempt the trailers are, as I feel that it preserves the sense of 1980s nostalgia. Both clips are quite silly, particularly the theatrical trailer, which is edited in a way that humorously makes use of Stallone's war cry. Rounding out the special features are production notes and extensive biographies and filmographies for the cast and crew. The weakest of the trilogy, Rambo: First Blood Part II is also the most disappointing DVD of the box set. In addition to the lackluster film, the audio tracks do not deliver quite like they should, and the commentary is guaranteed to put anyone to sleep.